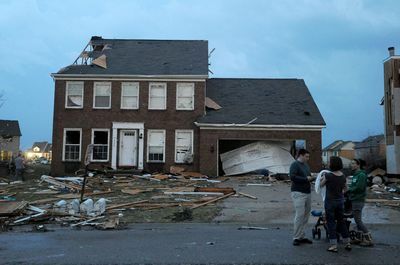 Posted on Thu, Mar 15, 2012 : 8:36 p.m.
People move belongings out of a house on the corner of Meadow View and York St. in Dexter after a tornado struck their home. No deaths or serious injuries have been reported from a tornado that ripped through the Dexter area, destroying homes and uprooting trees, the Washtenaw County sheriff’s department reported Thursday night. Derrick Jackson, spokesman for the Washtenaw County Sheriff’s Office, said an estimated 68 homes were damaged, and at least 35 were uninhabitable. “We’re still doing door-to-door,” he said at about 10 p.m. from the public safety staging area at Dexter High School. People stand outside of a home on Noble Drive in the Huron Farms neighborhood in Dexter after a tornado touched down. 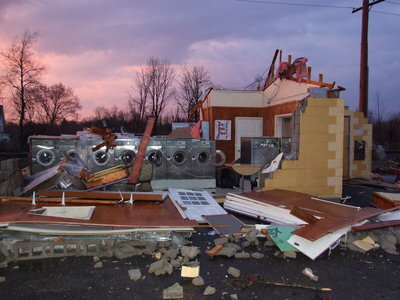 The tornado destroyed the Village Car Wash & Laundry Inc. on Second Street. Lt. Mike Grissom of the Dexter fire department communicates with colleagues about the Dexter tornado damage. Wooden remnants of homes and businesses were splattered throughout yards and streets in the worst-hit areas, like the Huron Farms subdivision off Dexter Road. Residents milled about, surveying the damage and chatting with neighbors about the natural disaster. Streets were jammed as drivers tried to get home or communicate with family members. “It’s just kind of surreal," said Dexter resident Silas Johnson. "We just live literally a block away, and a block away everything looks good and over here it’s torn up. "It’s just surreal," he repeated. Crews from multiple regional fire and police departments responded to the village, in addition to Huron Valley Ambulance and many disaster response businesses waiting to be called in to secure homes and start the cleanup. Emergency crews were stationed at major intersections in the village, which largely was without electrical power along Baker Road. Crews also were dealing with a gas leak on Central between Second and Huron, Jackson said. Roads were closed to most traffic, with police running checkpoints at the intersections. Despite the enormity of the destruction, both public safety responders and volunteers mobilized quickly to see what needed to be done, Jackson said. The American Red Cross and Salvation Army were on the scene, as were doctors and nurses who stopped by to see if they could help. The wave of volunteers included residents with backhoes and bulldozers who just put their heavy equipment to work as quickly as they could after the tornado. Dozens of homes Huron Farms east of Dexter had storm damage, with several torn apart, with walls, roofs and windows blown off. Most were still standing, but their interior stairwells were visible from the street, which was littered with random debris. Emergency vehicles flooded the area. A resident of Meadowview Street off Dexter-Ann Arbor Road reported his neighbor’s house was severely damaged. At Mill Creek School, volunteers were standing by, waiting for residents who needed shelter. They had pizza and coffee ready, along with buses for transport. Many homes were heavily damaged on the south side of Dexter, and the Village Car Wash & Laundry Inc. on Second Street was flattened. Trees crashed through roofs in several locations. The National Weather Service said a "significant'' tornado touched down in Washtenaw County at about 5:15 p.m. near the Hudson Mills Metropark and passed through the Dexter area. Meteorologist Steve Freitag said the tornado was on the ground for an estimated 25 to 30 minutes and cut a swath of about 10 miles. "Hopefully this is the worst of the severe weather this season,'' he said. The storm uprooted a tree estimated to be 4 feet in diameter at the Dexter Cider Mill. 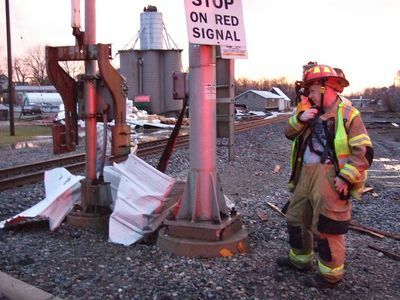 It fell away from the building, which sustained only minor damage. Miraculously, several trees fell on one family’s 200-hundred-year-old house but did only minor damage to the house. People were milling about, and some were working to clear fallen tree limbs. Power was out in much of the area, but Aubree’s restaurant and Dairy Queen in downtown Dexter still had power. There was a line outside Dairy Queen about 8:40 p.m.
Pamm Hopkins was on her way home to Webster Township from her job in Chelsea at about 5:30 p.m. when she heard the emergency warning sirens go off. “I was looking toward North Territorial Road, and it wasn’t looking good. I got home and turned on the TV and saw the rotations at North Territorial and Dexter-Pinckney Road so I piled my purse and the credit cards in the bathtub, then herded the two cats into the bathtub with me,” she said. Hopkins said she kept peeking outside and heard “the loudest crack of lighting I’ve ever heard in my life, and then it was like a freight train. It was loud, loud, loud and it seemed to last forever, but it probably lasted five minutes. Then there was hail for 20 minutes and I looked out and I had a new frog pond in my backyard and there was a stray toy floating in it." 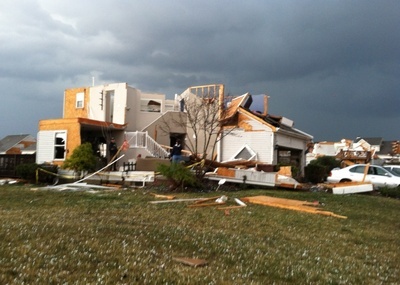 The tornado damaged this home in the Huron Farms subdivision east of Dexter. Once the storm had passed, "I decided to go out and look at the damage to my property," where she's lived for more than 25 years off Huron River Drive in Webster Township. She said there are three little houses on her road and she looked out at the line of evergreens that are between her neighbor’s home and her own, and they were all down, "flattened," she said. While outside she said she spoke to her neighbor who told her their family piled in the crawl space under their home. Still without power, she said “The guy next door saw it come across the river and take out his trees and filmed it,” she said. Many drivers were simply trying to get home or survey the damage throughout the community, but it was difficult to travel because police blocked off many streets. Dexter Village President Shawn Keough was still at Dexter High School at 9:30 p.m. Thursday night, a staging area for first responders from the area . The Westridge resident said his subdivision did not have power and he was waiting to get back to his home near Island Lake Road and Dexter-Pinckney Road. "Thank God, there have been no reports of loss of life," he said. Even areas of the county that escaped the tornado were battered by thunderstorms and hail. Freitag said unusually high temperatures -- ranging from 75 to 80 degrees in Washtenaw County -- helped create conditions for severe weather. "Once the storms were able to fire up, they create their own cold pool of air and they just fed on the instability in place over southeast Michigan,'' he said. He said the result was thunderstorms that produced hail the size of golf balls and dumped up to 5 inches of rain on portions of the county. There were reports of flooded streets and yards throughout the area. Freitag said there also was a likely touchdown of a tornado in Lapeer County, as well as one in Monroe County. The storms that slammed through southeast Michigan caused about 6,000 DTE Energy customers to lose power, the utility said. That included about 2,500 customers without power in and around Dexter and about 500 in Ann Arbor. About 1,300 were also without power in Saline. "We hope to get the majority of the power restored by" Friday, DTE said. "But full restoration will depend on the extent of the storm damage to the electric system." Sun, Mar 18, 2012 : 2:30 p.m.
Fri, Mar 16, 2012 : 2:30 p.m.
@RoboLogic .... agreed. I will never own a house without a basement for this precise reason. I am thankful the sirens were activated early enough, thankful that I happened to be watching the news when they said the bulk of the storm was near N. Territorial and Dexter-Pinckney Roads at that point, thankful that I heeded the warnings given, and most of all, thankful no one was killed or seriously injured. Fri, Mar 16, 2012 : 1:15 p.m.
Let see if this works. Fri, Mar 16, 2012 : 1:14 p.m. Please explain why my comments are hidden! Fri, Mar 16, 2012 : 1:13 p.m. I was there last night and it is amazing no one had serious injuries. Fri, Mar 16, 2012 : 12:58 p.m. Thank God for no serious injuries. Every home should have a weather alert radio - what if this tornado struck at 2:00 AM in the morning? Fri, Mar 16, 2012 : 1:16 p.m. Thought I would try a reply. I do not understand why my comments are deleted or hiden! Fri, Mar 16, 2012 : 12:36 p.m.
My comment said its hidden because I submitted an abuse report. What? Happened to me too. I cold not figure it since I hadn't touched anything. Maybe I did? Who knows. Computers. They are all glitchy. Fri, Mar 16, 2012 : 12:52 p.m.
Nobody is taking up a collection? Oh thats right, they have insurance. Scary stuff! The laundry picture could be an advertisement for those washers and dryers. Everything around them is destroyed, but looks like they made it out without a scratch! Fri, Mar 16, 2012 : 2:52 p.m. I was thinking same. Great minds. Fri, Mar 16, 2012 : 11:32 a.m. It would be very helpful if AnnArbor.com would publish a list of &quot;dos&quot; and &quot;don'ts&quot; to follow during tornado emergencies. 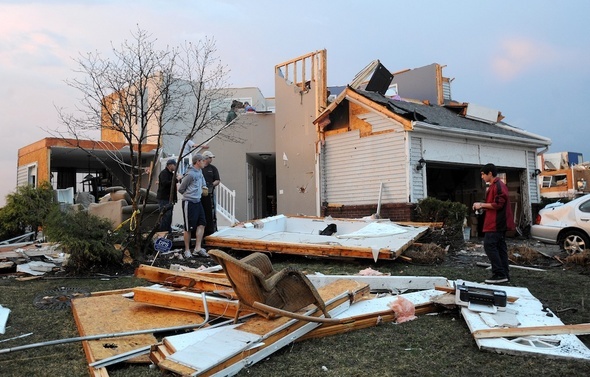 Fri, Mar 16, 2012 : 10:16 a.m.
A2.com: It would be helpful if you include a map showing where the tornado touched down, its path, etc. Fri, Mar 16, 2012 : 2:21 a.m. I have never...and will never... own a home without a basement. This had the potential to be much worse. Many thanks to the Ham Radio Operators who volunteer their time as Sky Warn Spotters. You probably helped save lives. Fri, Mar 16, 2012 : 2:16 a.m.
That hail was intense too...especially if you were in a car. I was stuck in that hail. What a noise that makes on a metal roof. Otherwise, was fun to watch. Glad no one got hurt in this. This storm could have been a whole lot worse. Fri, Mar 16, 2012 : 1:44 a.m.
My friend Angie lost her car due to flooding. :( I was held up at work in Saline. Glad I stayed after work and didn't try to run home. There is probably a large pond outside my house but it's too dark to see. So glad there were no injuries or death. The frogs are having a grand ol' time. At least someone(s) are happy.